We’re pretty spoiled for choice on things to write about at Queen B, but I have to say that one of my greatest delights is when our customers share photographs with us of their events and we can see our hand-crafted beauties doing their thing. It is one thing to sell beeswax candles, it is another thing entirely to make natural light. It’s one thing to use candles at a wedding or event, it is another thing entirely to use completely natural beeswax candles with their unique golden light (not to mention that your guests don’t have to breathe in toxic fumes all night)… that simple choice will not just create a special ambience, but you’re also supporting bees, our beekeepers, the regional communities they live in, jobs at Queen B… not to mention the environment and planet! One small step for man, one giant leap for mankind. 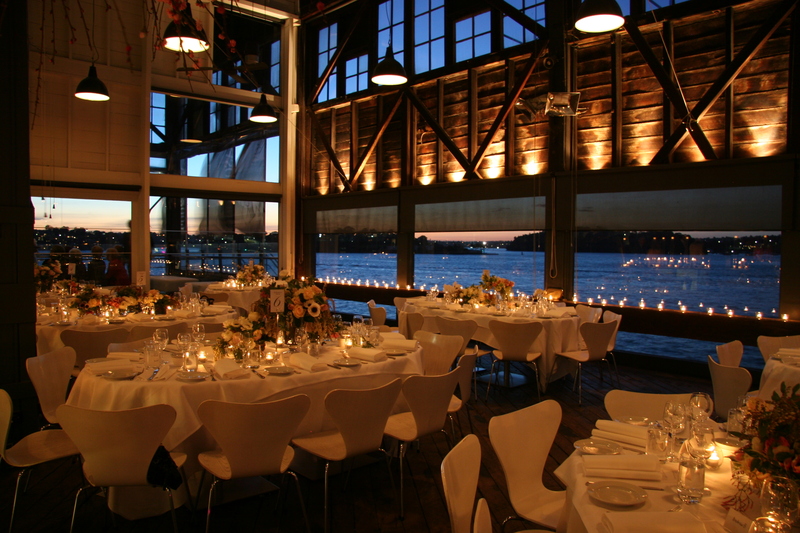 Wedding… becomes eco wedding… luxury wedding… different… special! 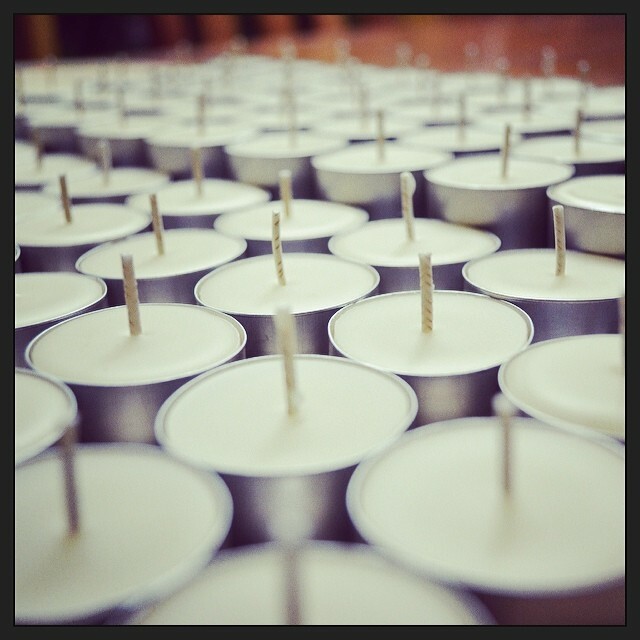 While my raison d’étre may be hand-crafting natural, non-toxic, carbon neutral, eco candlelight, we are fortunate that our candles appeal just as much to the luxury end of the market as they do to the conscious or eco consumer… not that they’re mutually exclusive! Anyway, I thought it might be nice to share some of the photographs from events we’ve lit. A picture speaks a thousands words (and, often, so do I!). 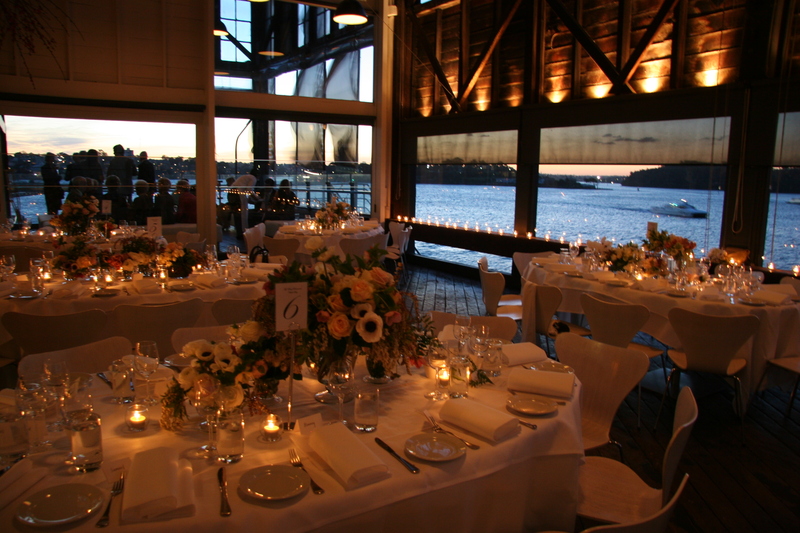 These photographs are from a wedding held at The Wharf in Sydney. Flowers by Grandiflora. 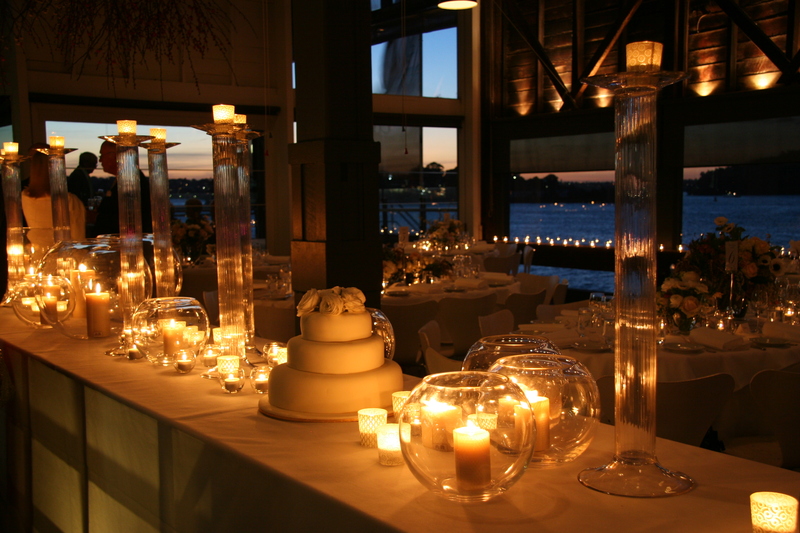 Ambience – rising to the challenge of creating a warm, romantic, intimate ambience in a huge warehouse space, our 8-9hr tealight candles were placed in mini-fishbowls at each guest’s place setting and dotted along the windowsill around the venue. NB putting candles into a glass not only provides wind protection but the glass reflects more light… giving you more bang for your hard earned buck. 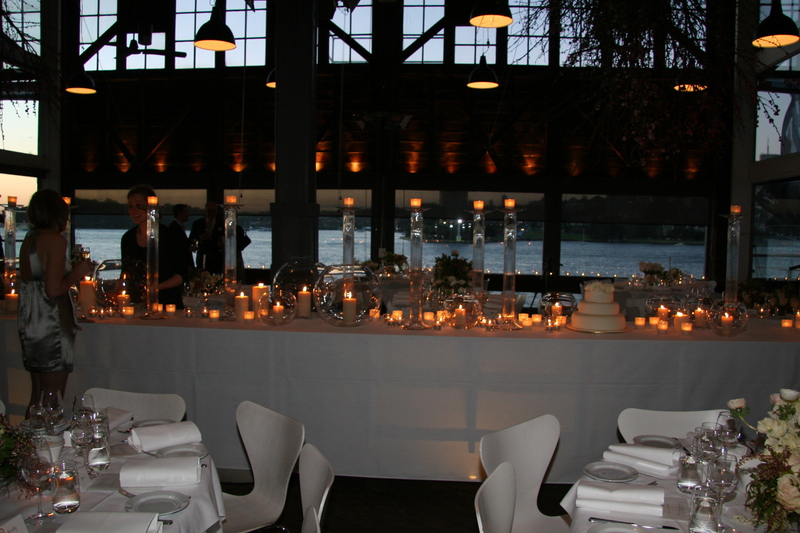 A sea of candlelight feature table – our bride wanted to create a sea of candles as a feature at the event. 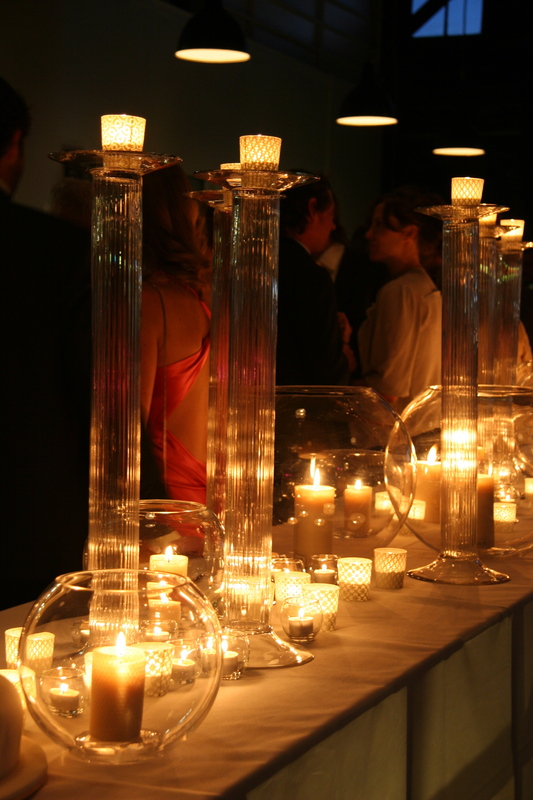 This was cleverly achieved on a budget by using large fishbowls, glass plinths, tealight holders and votive holders along with various sizes of candles to create the look. 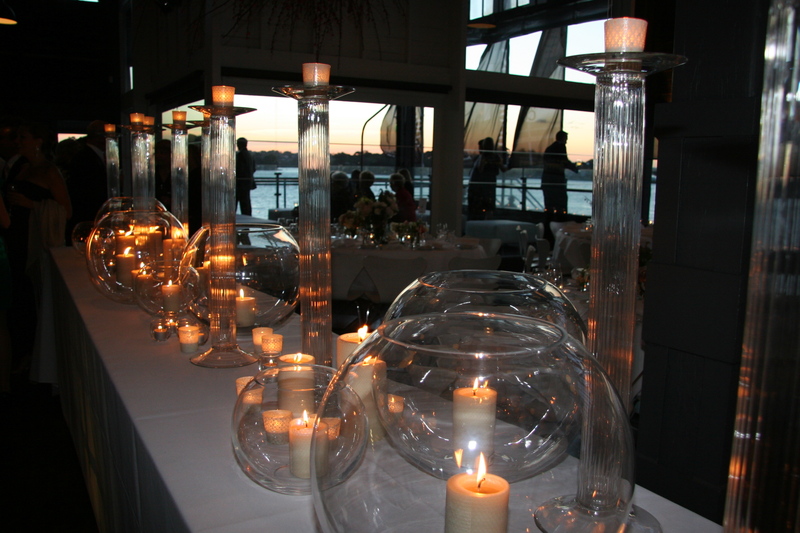 The flickering of the flames reflecting off the glass holders of different sizes and shapes created the look of hundreds of candle flames. 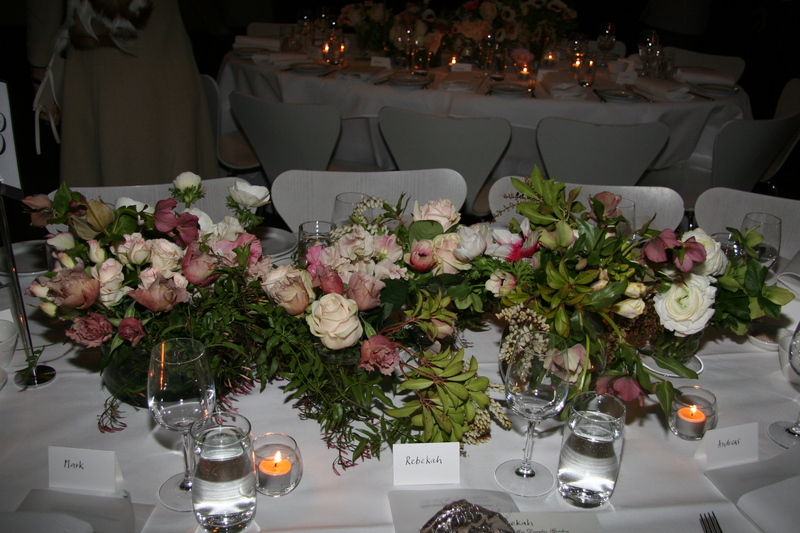 most good florists will have glassware that they can lend/hire to you for the evening rather than purchasing it. otherwise, most Vinnies stores have a huge range of glassware for sale… I’ve lit an event before where I bought over 150 glasses for 50c each and then dropped them back the next day. That’s a win win! And the different sizes, shapes and heights of the glasses create a beautiful look… if that’s the look you’re going for!… it’s not the luxury eco wedding look, but it is a lovely look!